For most babies, sucking is a soothing sensation. According to the Mayo Clinic, there are clear benefits to using a pacifier, like calming down a fussy baby, offering a distraction from a blood test or shot and helping the child fall asleep. However, it's important not to let your baby grow overly dependent on the pacifier of allow prolonged use that could result in dental problems. By the time babies reach about six months, they have usually started teething. When the child gets cranky due to sore gums a teething toy can be a major relief. If you're interested in purchasing a natural pacifier or teething toy for your child, you might want to opt for one made with all-natural materials. Learn more about your options so you can make an informed selection. Here's what you need to know about natural pacifiers and teething toys. "Pacifiers and teething toys are made from a variety of materials." Pacifiers and teething toys may be made from a variety of materials, and there are important differences. According to What to Expect, a single-piece model is preferable to versions with multiple pieces that can break apart and become a choking hazard. In addition, silicone is a better idea than latex, which is less durable and may cause an allergic reaction. However, for some parents, the concerns about what their kids are putting in their mouths do not stop there. As CBS News reported, many are concerned about the presence of the plastics chemical Bisphenol-A in teethers. Studies have connected high amounts of BPA with hormonal changes and health problems, leading to changes in how products like baby bottles and sippy cups are manufactured. Research published in the journal Environmental Science and Technology warned that even products labeled BPA-free may contain low levels of the chemical and other endocrine-disrupting compounds. It's not clear what effect the resulting combining substances might have on small children, but concerned parents may prefer to stick to products made with all-natural ingredients. Sticking to pacifiers and teethers made with natural parts can minimize some of these worries. All-natural pacifiers are made with rubber that's even softer than silicone and manufactured as a single piece. Plus, these pacifiers are free of artificial colors, chemical softeners, BPA and other additions parents might prefer to avoid. Look for a pacifier that will fit comfortably in your child's mouth. 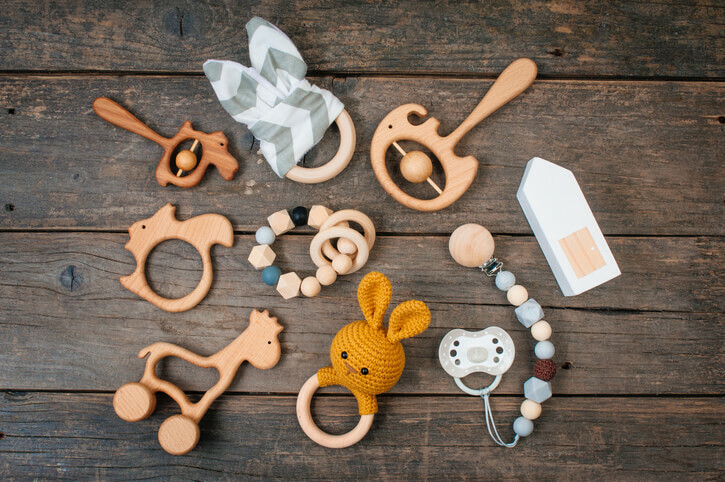 There are even more choices for organic teethers. These products may also be made with rubber, but as A Child Grows in Brooklyn explained, there are also varieties manufactured from cotton or maple. Some popular options come in fun animal shapes or rings. Other teething toys are designed to be chilled in order to provide further comfort to your baby's aching gums. Finding the right pacifier or teething toy for your child could make a big difference in his or her comfort and your peace of mind. If you're not sure what product to select, ask your pediatrician for advice.